An investment of over £5m in 25 brand new low emission buses by First West Yorkshire has introduced a step change in air quality on the Leeds Bradford transport corridor recently. 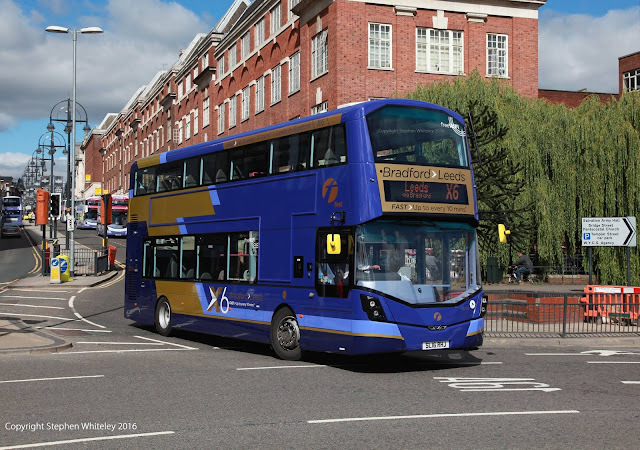 The order by First West Yorkshire, which features new WrightBus StreetDeck double decker buses, underlines its commitment to delivering high quality services for its customers and partners which fit hand-in-hand with local authorities' targets to improve air quality for local communities. All the new buses feature luxury e-leather seating, with complementary on board Wi-Fi providing passengers with free internet access. First Bus customers are already benefiting from Smart ticketing options and Real Time Information, while all customers can use their mobile phones as bus tickets through the company’s m-Ticket option. 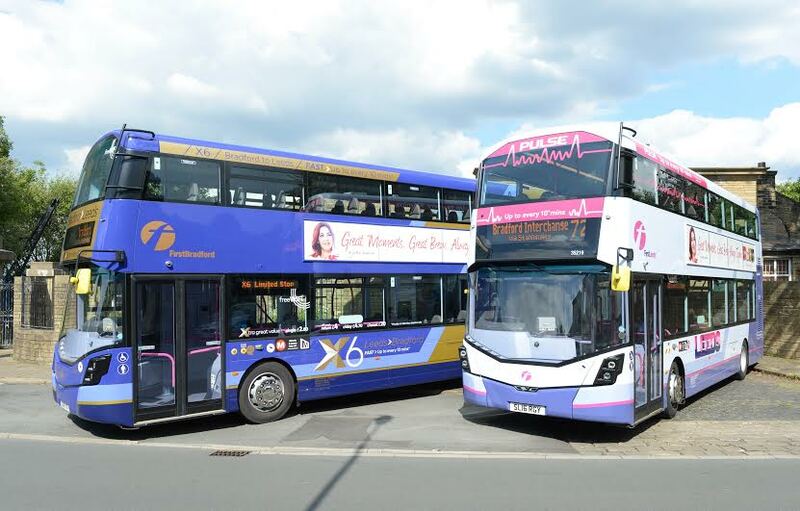 The investment by First West Yorkshire is part of a package of improvements that see the frequency doubled on the X6 service which provides a new limited stop service between Leeds & Bradford every 10 minutes Monday - Saturday daytime, with a striking new livery and USB charging points for customers. The 72 Leeds - Bradford service operates now with new double decker buses providing nearly 50% additional seating capacity. The new buses, which are manufactured by WrightBus in Northern Ireland are all Department for Transport ‘low carbon certified’ and will save an estimated 250,000 kgs* of CO2 per year. All of the 25 new buses are fitted with the latest Euro VI engines, which produce 95% less oxides of nitrogen (NOx) emissions compared to buses with Euro V engines, helping improve air quality across the region and meet the shared vision of our local authority partners in cutting carbon emissions and air pollution. 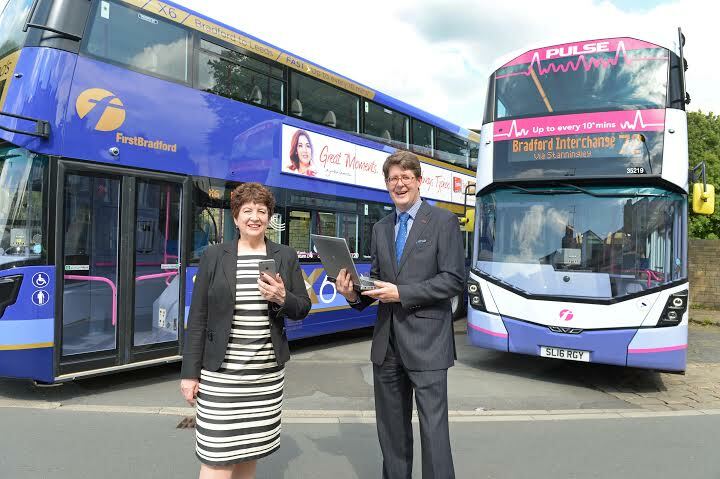 Oliver Howarth, Business Director at First West Yorkshire said the launch was great news for customers and for local communities: “This investment of over £5m in low emission, high quality bus journeys gives customers luxury, high-tech travel with increased frequency and increased capacity. These new buses are among the most eco-friendly on the market and reflect our commitment to working with our partners to reduce emissions and improve air quality for the region." The introduction of the new buses was celebrated with West & North Yorkshire Chamber's Chief Executive Sandy Needham. Sandy said: "Buses play a significant role in supporting our local economies and communities and I'm delighted to see this investment in modern, clean and comfortable buses. The new features including USB charging points will be welcomed by the thousands of people who travel between Bradford and Leeds." *New vehicles reference above have been independently certified as producing 30% less greenhouse gas emissions (eg CO2) than an average Euro III bus. 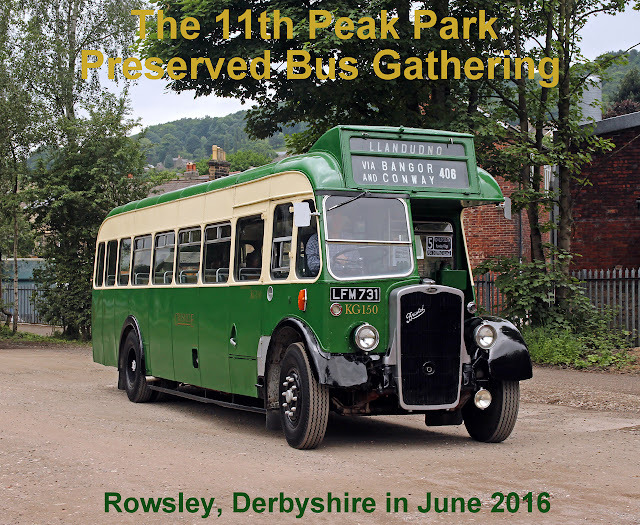 The above estimate is calculated from fuel consumed and assumes the introduction of the new vehicles displaces operational mileage which would otherwise have been undertaken by either Euro III buses or by buses of equivalent efficiency. Glasgow Subway to Extend Hours?